The Big Give Christmas Challenge is on NOW! Between Midday today (Tuesday 28 November) and Tuesday 5 December, donations made to our project via theBigGive.org.uk will be doubled at no extra cost to you! Our aim this time is to raise £8,000 from individual donors (which will be doubled to £16,000). We are raising money for our Shades Day Fund, a fund we created earlier in the year to help with the maintenance and replacement of our fleet of caravans. Our caravans are located at Haven or Butlin’s holiday parks throughout the UK, and provide vital holiday accommodation near the seaside for hundreds of struggling families every year. Back in September we received a letter from Alison. 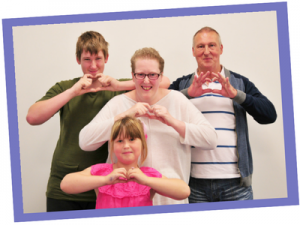 Alison and her family were referred to us by their Family Support Worker in Rotherham. She is a wife and mother whose life was turned upside down in 2015 when she was diagnosed with cancer for the second time. We helped her and her family go on a short break to our caravan housed at Haven’s Primrose Valley holiday park in North Yorkshire. If you have any questions, don’t hesitate to get in touch with us at michael@FamilyHolidayAssociation.org.uk.